DJI Is Building a 360° Camera Drone, When Will We See It? The 360-degree camera revolution has arrived but so far no commercially successful drone has implemented a 360° camera. We already have some clues that DJI is planning something big – the DJI 360° Drone is coming. What features will it include? What will it look like? When will we see it? All will be answered. When DJI releases their first 360° camera drone everyone will say they didn’t see it coming. Everyone but us. 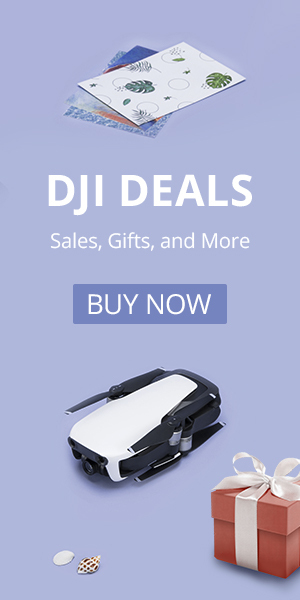 In October 2016 DJI shocked the world with the release of the DJI Mavic. Overnight the world of consumer drones changed forever. Overnight the hopes and dreams of the GoPro Karma drone were crushed. The DJI 360° camera drone will be a sight to behold. The legs are retracted for unobscured video capture. If you thought the Mavic was a revolution, just wait for DJI’s next surprise. The DJI drone will include one of the best 360° cameras on the market. Gone will be the gimbals. Gone will be a limited field of view. DJI will release the first successful 360° camera drone and, just like the game-changing Mavic, we predict it will be a huge success. Big names like GoPro, Garmin, and Kodak have all released high-end 360° cameras in the last year. What makes 360° cameras different? These cameras are crammed with two or more individual cameras that simultaneously record and stitch video that is 4K or higher in total resolution. The full spherical 360° coverage means that there is no chance of missing the perfect angle in the video recording. Video can be edited to look like normal narrow-field footage or it can be viewed with an immersive 360-degree viewer as simple as a Smartphone or as fancy as VR (virtual reality) goggles. It also means that the video can be electronically stabilized with no loss in the field of view of the recording. Other well-known companies like LG have released more affordable entry-level cameras. Popular startups like Insta360 have entered the market with small and powerful commercial successes. Why now? What is the enabling technology powering the 360° camera revolution? The answer is two-fold: Inexpensive sensors and cheap but powerful processors. Check out our article on inexpensive 360° camera options. Powerful, efficient, and tiny image processing chips are enabling the fast processing and stitching of millions of pixels from multiple sensors. Sensor price has plummeted in recent years as the number of digital cameras in the world has approached the number of people in the world. Processing power is also a big player in editing videos. As processing capabilities improve, 360-degree cameras will only get better, and DJI has waited for the technology to mature. We believe that DJI’s 360° Camera Drone will record 8K video, which has 4 times the pixels of 4K. Faster streaming speeds from services like YouTube are also making the delivery of high-quality 360° video more realistic. One of the biggest challenges with 360° cameras is where to hide the cameraman. A 360° camera sees everything including the person taking the pictures and any tripods or other apparatus being used. Drones solve this problem by eliminating the cameraman and the tripod. The only challenge that remains is hiding the drone. A 360° camera drone has overlapping fields of view in order to create complete spherical coverage of the world around it. By building a slim drone and positioning a camera on the top and bottom of the drone, the drone can be eliminated from view! This amazing feat is accomplished by stitching the two overlapping fields of view as shown in the picture above. The result is perfect 360° coverage that allows the viewer to float through the air and look in any direction they like. Incredible! The drone could be made thinner as seen in this recent patent filing. HalfChrome has provided a glimpse into the possibilities by strapping the affordable LG 360 Cam camera on top of and below drones like the DJI Phantom 3, the DJI Mavic, and the DJI Spark. This view provides a true one-of-a-kind experience, but the camera can’t hide the body or propellers of the drone without a camera on both top and bottom of the drone. For the last couple years, there have been subtle clues that DJI is working on a 360° camera drone. These clues include a 2015 teaser video of the concept drone dubbed the “Phantom X,” and the 2017 inclusion of near-360 degree photo capability in the DJI Spark, and the release of the race edition Goggles RE. Do you want to make money flying drones? You will need to pass the Part 107 Test. The Drone Pilot Ground School has an astonishing 99% first-time pass rate for the exam. Click on the image above to learn more. The Phantom X 360° camera drone. The biggest source of intelligence comes from DJI’s concept video describing the “Phantom X“. While the video does not explicitly describe the Phantom X as a 360-degree camera drone, the careful observer will notice that it pretty much needs to be just that. Why? For one simple reason – the camera isn’t hung low enough for the bottom-facing camera(s) to see forward when the drone is pitched at an angle. This single observation means that if the Phantom X ever becomes a reality it will need to be a 360° camera drone. The Phantom X will almost certainly have a top-facing camera or set of cameras so that the view of the pilot and of the recorded video is never obscured. In the summer of 2017 DJI released an update to the Spark that allows it to take a 180° hemispherical image of the world. While this is very different than including a 360° spherical camera system, it does show that DJI is already thinking 360. They even included software in the DJI GO4 app and in the DJI Media Maker editing software that allows the user to view these images in the very cool “tiny planet” view. Tiny planet allows the viewer interact with the scene and see everything at once in a very cool and often surreal way. The image below is static but many apps let you zoom and spin the image. The slow process of capturing 180° pictures on the Spark is not perfect. Our favorite little camera drone takes 21 individual narrow field-of-view images and stitches them together. There is no possibility of 360° video since the images are not taken simultaneously. The long capture time also means that the images sometimes have artifacts if the drone or any objects in the field move during the capture process. And, of course, the Spark can’t look up very far, so the possibility for full 360° coverage does not exist. The 180° pano mode has since been added to other DJI drones as well, but the same basic limitations apply to those drones as well. What may appear to be a simple add-on feature of the latest goggles from DJI might end up being their most important feature. The Goggles RE, which was just announced in November 2017, support immersive viewing of 360° spherical images. 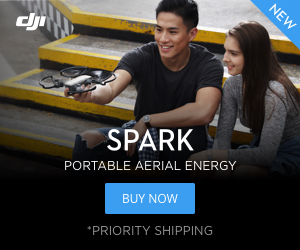 Right now only the Spark can record these images, but we think this is just one more sign that DJI is preparing for the release of their 360° camera drone. A recent patent filing details how a drone’s forward direction will no longer need to be the front of the drone, but rather may be controlled by the direction the pilot is looking. Goggles RE plays right into this idea. Someday soon your drone won’t have a front anymore. Or a top. Or a bottom! DJI isn’t the only company interested in 360° cameras on drones. Recent patent filings include some novel designs. A handful of designs use a central propulsion system to help keep the props out of the view of the cameras. A 360° camera drone with 4 separate cameras and a novel central propulsion system. A 5th camera may help with FPV flight. In another concept, the camera can be stowed inside the drone for safe takeoff and landing and easier packing and transporting of the drone. The camera can even be removed for use outside of the drone. This image from a patent filing suggests a 360° camera that can retract for landing and then be removed!